On the 1st of April 1961 the heliflight, later called the 40th Squadron, was formed at Koksijde. The heliflight consisted out of five Sikorsky HSS-1 which were build in licence by Sud-Aviation in France. The first two HSS-1, OT-ZKD/B4 and OT-ZKE/B5 were delivered on 04/05/1961, while the third (OT-ZKF/B6) was delivered on 02/02/1962. The two other HSS-1, OT-ZKG/B7 (delivery 20/03/1962) and OT-ZKH/B8 (delivery 19/04/1962), were for the Navy. Two years after the formation of the heliflight, the Short Range Transport Flight was formed for logistic support, short distance transport, VIP transport and support with disasters. For that reason, an other five Sikorsky S.58C were bought with SABENA. It were OT-ZKI/B9, OT-ZKJ/B10, OT-ZKK/B11, OT-ZKL/B12 and ZT-ZKM/B13. These helicopters were delivered between 1963 and the beginning of 1964. In 1969 another two ex-Sabena helicopters were bought, the OT-ZKN/B14 and OT-ZKP/B15 and were used for VVIP transport. In 1974 the heliflight was renamed into 40th Squadron Helicopters. In 1974 the Belgian Air Force ordered 5 Sea King MK.48 to replace the Sikorsky fleet. Between 30 January 1975 and 10 June 1976, the five remaining S.58C were sold to Germany. The remaining HSS-1 (B4, B5, B6 and B8) remained in Koksijde for training and transport purposes. 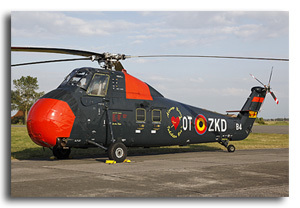 OT-ZKF/B6 did its last flight on 10 May 1979 and can still be seen in the Brussels Air Museum. The OT-ZKH/B8 made its last official flight on 19 July 1986, and this was also the very last flight of the 'siko' in the Belgian Air Force. For this event, a special decoration was applied on the OT-ZKH/B8. 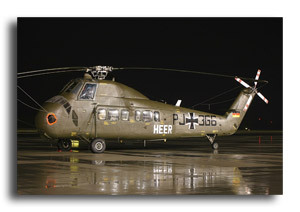 In 1991 this sikorsky was placed at the entrance of the base and the special tail for the last flight is still on it. The Sikorsky OT-ZKK/B11 is preserved at the "Auto Und Technik Museum" of Sinsheim (Germany) as D-HAUF.